Today's Friday photo is a very current one that I took about an hour ago ;-) As I've mentioned in previous Friday photo posts, I'm going to make an effort to share more of a mix of photos...some from the past and some that are more recent. 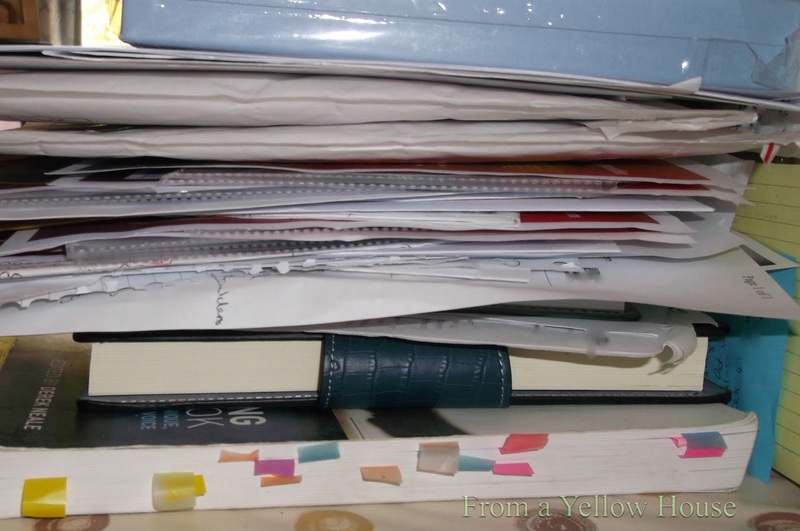 This pile is kind of like an inbox for me so I need to go through it and put things in their proper place. 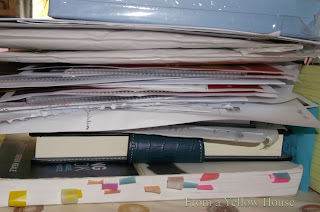 When something comes in the mail or I make a note about my book or something, it often ends up in this pile. Looking at the pile now I'm amazed that it hasn't fallen over since it looks a little bit top-heavy. I think that a good start will be to rescue my book and notebook from the bottom because I really don't want to have to pick up everything all scattered across the floor...nope! Lol. I'm actually quite an organized person but it seems that since I've been working on my book, a few other things stay waiting for me in piles. Actually clutter makes me kinda crazy even though this pile looks like I'm a pack rat. Lol. Anyway, no excuses...gotta clean up! You sound like me! "Quite organized" but with that one spot in the house that gets piled up -- my desk! Exactly!! That pile just always seems to materialize. Lol.